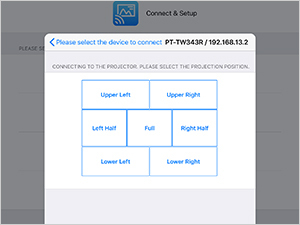 This is an application that lets you send PDF files, PowerPoint files, and images saved to an iPad, iPhone or iPod touch to a wireless projector or flat-panel display over a wireless LAN (Wi-Fi), and display them. You can send document files transferred from a PC via iTunes to the Documents*1 folder of this application, and images saved to the Photos*1 folder of your iPad, iPhone or iPod touch. You can also display web pages with the built-in web browser, and photos taken with the built-in camera on your iPad, iPhone or iPod touch. In addition, the application also lets you rotate the screen, enlarge or reduce the screen with a pinch operation, and flip through pages with a flick operation. *1 Files that are saved anywhere other than these locations cannot be displayed. Also, document files that contain animation, links, embedded motion images or audio, a Slideshow function, word art, comment displays, or have been scanned at high resolution cannot be sent. Download from the App Store . *2 Visit the App Store for the latest information. *3 How to prepare, connect, or use vary depending on display device model. Please confirm the model number and its applicable group. *4 Wireless Module model-number varies depending on your display device. 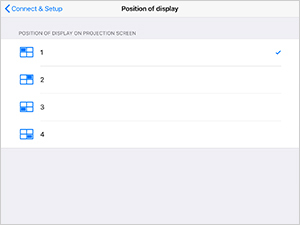 Display with multiple iOS devices simultaneously. 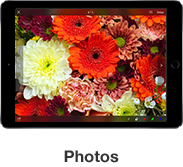 Control your display device using your iOS device's web browser. *5 You can draw freehand lines on a blackboard-like screen. *6 Above function may differ depending on the display device to connect. Please refer to the List of Applicable Models for the details. Also, some buttons may differ depending on the display device to connect. The screen/operation image or screen layout in this web site is for a projector and iPad. The picture varies for some screens when using flat-panel display or iPhone/iPod touch. 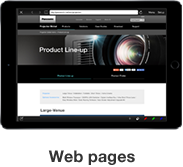 “Display device” on this page means Panasonic display (projectors and flat-panel displays). 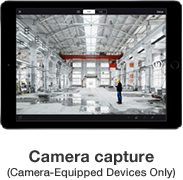 For details on how to use or configure the display device, as well as precautions on wireless use, refer to your display device’s "Operating Instruction" and "Network Operation Manual". Connection between iOS device and display device is maintained for three minutes after the application screen is closed, and is thereafter automatically disconnected. If you wish to use the application again, first reconnect the iOS device and display device. If you require a notification of disconnection while using other applications, activate [Wireless PJ] - [Notifications] - [Allow Notifications] in iOS [Settings] menu. 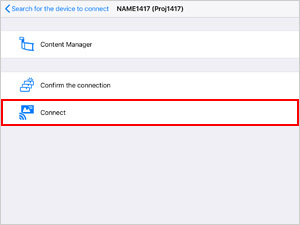 Your iOS device needs to be connected to display device's network via Wi-Fi using the iOS device's setting in advance. Follow the procedure below. *1 Please refer to the List of Applicable Models for the model number and its applicable group. [SIMPLE] network connection is recommended for use with compatible models. 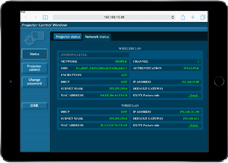 3) Join the local wireless network from your iOS device. On your iOS device, tap [Settings] – [Wi-Fi]. Tap the same access point name (SSID) that is displayed on the idle screen. Input the KEY that appears on the idle screen, and then connect to the wireless LAN. 4) You will be prompted for a password. 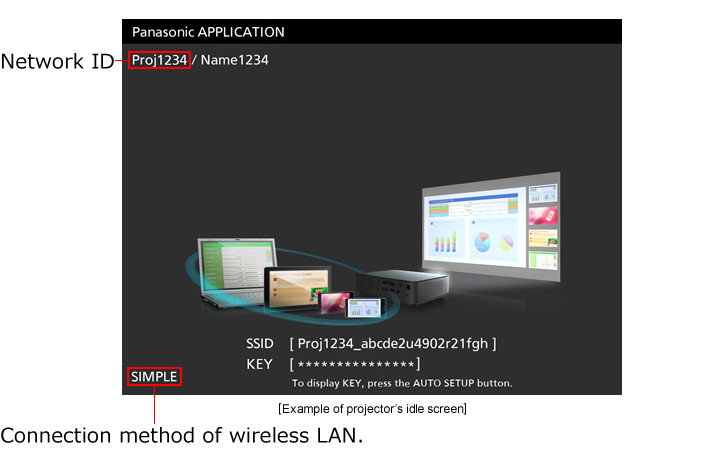 3) Switch the input of projector to [Panasonic APPLICATION][NETWORK]. 4) Join the local wireless network from your iOS device. You will be prompted for a password. Input the [M-DIRECT] KEY, and connect to the wireless LAN. 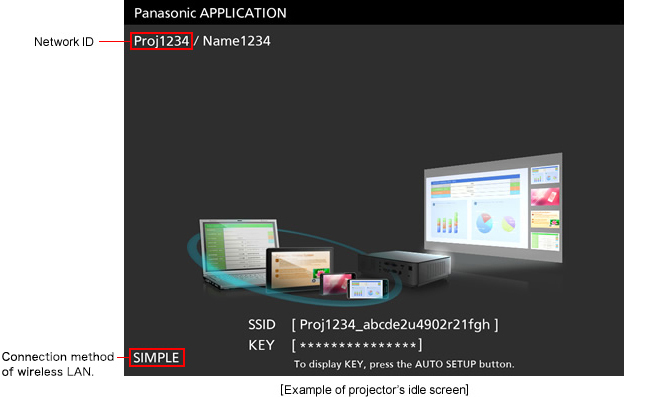 3) Switch the input of display to [Panasonic APPLICATION] [NETWORK]. You will be prompted for a password. 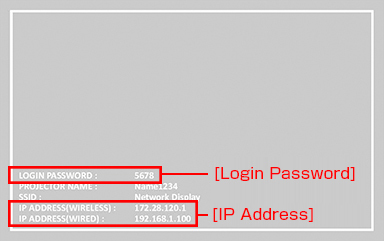 By inputting [M-DIRECT＊＊＊＊] (＊＊＊＊ is the last four digits of Network ID), your display will be connected to wireless LAN. Tap the Details button on the right of [M-DIRECT＊＊＊＊] and Turn [Auto Connection] ON. [Auto Connection] may have already been set to [ON] depending on the version of your iOS device. When installing multiple wireless display devices nearby, some display devices may be difficult to find. In that case, please refer to “When Multiple Users Display Images” of the “Tips” section. No Wi-Fi icon will be displayed at the upper left of the iOS device screen to indicate Wi-Fi connection when using the above connection method. To confirm connection in this case, see "Note" under <Make sure the Wi-Fi setting is activated> in "The Display Device is Not Shown in the [List of Available Devices.]" item of the "Troubleshooting" section. * For E group projectors, follow the procedure 1, then 3. 2) Setting Up the display device's Wireless LAN. In [NETWORK][WIRELESS LAN], select . 3) Switch Display Device Input to [NETWORK]. On your iOS device, tap [Settings]-[Wi-Fi]. Tap [Panasonic Display1] or [Network Display][Network Display＊＊＊＊]. Wireless LAN will be connected. When prompted for a password, enter the default password. If you do not know the password, please refer to the display device specification pages or ask network administrator for further details. select the Details button on the right-side edge of the connection network, and turn [Automatic Connection] ON. In [NETWORK] or [NETWORK/USB] – [WIRELESS LAN], select a user identification ([USER] or [USER1] – [USER3]) from wireless network number. Complete the wireless LAN detail settings for your access point. 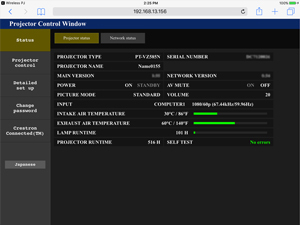 3) Switch the input of your display to [Panasonic APPLICATION][NETWORK]. 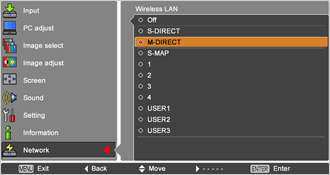 Tap the access point name (SSID) specified in Step 1). Your iOS device is now connected to the local wireless network. If your access point is encrypted, a password input screen is displayed. If you do not know the password, ask your network administrator. Before the data of a PowerPoint or other document file can be displayed, you must transfer these files from your computer to this application's [Documents] area in iTunes. Transfer files from your computer as follows. On the top of the screen, select . In the sidebar on the left of the screen, select [File Sharing]. In the [File Sharing] – [Apps] list at the right of the screen, select [Wireless PJ]. Click [Add...] on the lower right and select the document files to transfer. The file types that can be transferred to the [Documents] area and displayed are PDF, PowerPoint, Excel, Word, Keynote, Numbers, Pages, Text, and RichText. To display PowerPoint or Keynote documents, convert them first to PDF. Transferred files are not added while the document files list is displayed. Close the list and then open it again. You can pass document files open in Safari or received as mail attachments to [Documents] for this application. In Safari or Mail, select [Open in...] and choose [Wireless PJ] in the listed applications. When operating or connecting to a display device by searching for the display device, how to connect may differ depending on the display device. Please refer to the List of Compatible Models for the model number and its applicable group. On the Home screen, tap the icon for this application. The display devices that are found are shown in [Please select the device to connect] screen. Tap the Network ID ([Proj＊＊＊＊]) of the display device to use. Select [OK] when the confirmation message appears, and connect the display device. Select [Connect & Setup] in the top menu or [Setup] in the top right on any screen of the application. Tap [Search for the device to connect] in the [SEARCH & CONNECT] column. The display devices that are found are shown in a list. Connected display devices are labeled with a check mark. To update the information in [Search for the device to connect], tap [Update]. Even after you press the Home button, the display device connection will be maintained for 3 minutes after you close the application screen. When [Do not display again] is turned ON at [Please select the device to connect] screen, [Please select the device to connect] screen will not be displayed at the next start-up. 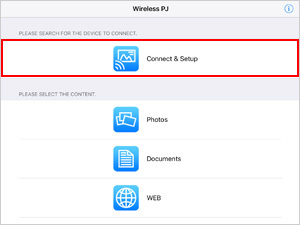 To display it again, turn ON the iOS [Settings] - [Wireless PJ] - [Show Simple Connection]. [Connecting to the projector] screen will be displayed. 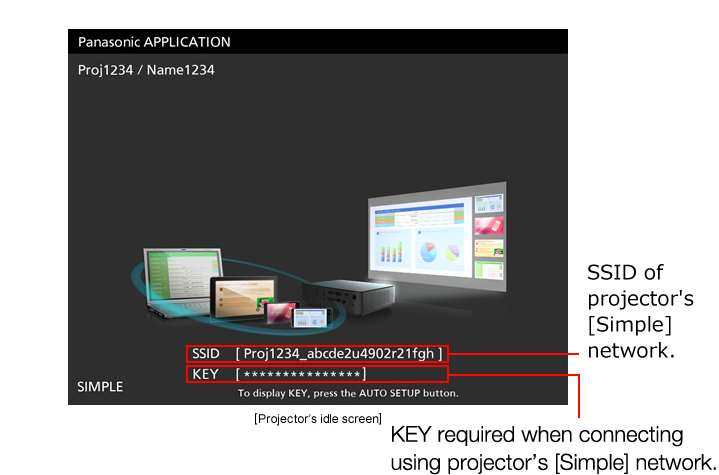 Tap the display device [Model Number/IP Address] or [Projector Name/IP Address]. Picture Position Selection screen will be displayed. Select the position to display. 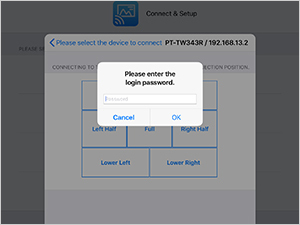 Enter Login password displayed on picture screen of the display device, and tap [OK] button to connect to the display device. List of searched display devices will be displayed. Tap the display device [Model Number/IP Address] or [Projector Name/IP Address]. 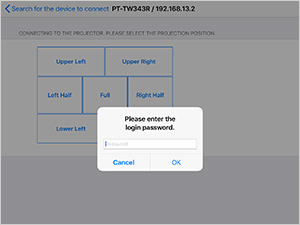 Input Login Password* displayed on the picture screen of the display device, and tap [OK] button to connect to the display device. [Please select the device to connect] screen is displayed and the list of searched display devices appears. 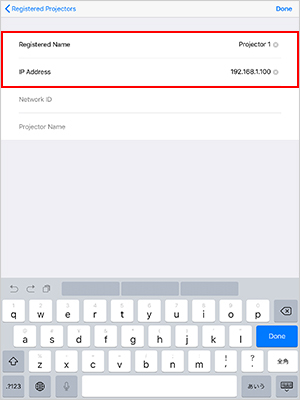 Tap the name of the display device to use (Network ID ([Proj＊＊＊＊]). You can call up [Content Manager] to set up and reproduce signage. Enter your “Username” and “Password” in the Space Player authentication dialog and select “Login”. The Content Manager page is displayed, and Content Manager can be used. You need to connect to the Space Player to display content from your iOS device. You can confirm iOS device connection in advance by getting the Space Player’s LED to flash. You need to connect to the Space Player to display content from your iOS device. Select [OK] when the confirmation message appears. The Space Player is now connected. Tap the Network ID ([Proj＊＊＊＊]) of the display device device to use. 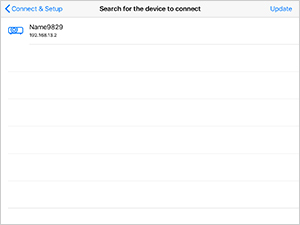 You can search for a display device by its IP address, register or edit search data, and connect. You can also export/import registered data. Tap [Registered Projectors] in the [SEARCH & CONNECT] column. Select [Projectors can be registered…]. Enter the [Registered Name] and [IP Address] in the registration screen, then press [Done]. The registered name will be added to the [Registered Projectors] list. 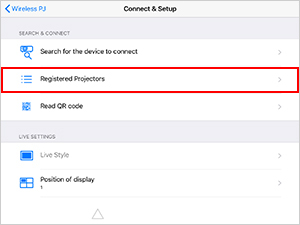 Select the registered name for the display device to be used from the [Registered Projectors] list. The [Registered Projectors] list can be stored. 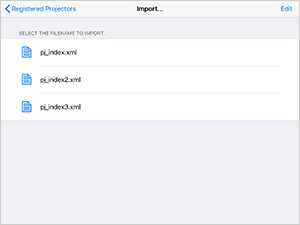 Select [Export...] in the [Registered Projectors] menu. Select [Import...] in the [Registered Projectors] menu. Choose the file to be imported from the displayed list, then select [OK]. 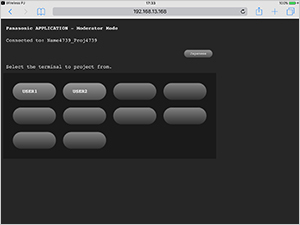 Select [OK] for the Import Success dialog, then return to the [Registered Projectors] menu. The imported list will be displayed. Select [Edit] in the [Registered Projectors] menu. Select the each line in the Registered Projectors List to enable editing. Also, you can do the following operations at the edit screen. Select [Edit] for the import file list. You can do the following operations at the edit screen. The exported registration data will be saved as xml data in the [Documents] area. You can enter up to 16 characters for registered names. You can enter up to 16 characters for file names and the characters listed below cannot be used. 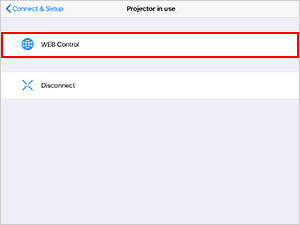 To go to the Web Control screen or Browser Remote Control screen, tap on the right of the projector name or display name/IP address in [Registered Projectors]. Enter your “Username” and “Password” in the authentication dialog and select “Login”. 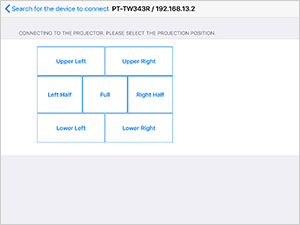 To display button, select [Projector Name or Display Name/IP Address] and connect it after registering it to [Registered Projectors]. 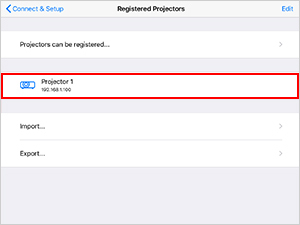 For projectors, Network IDs or projector names that have previously been registered or connected may be displayed as ----- or as a model number for some models. 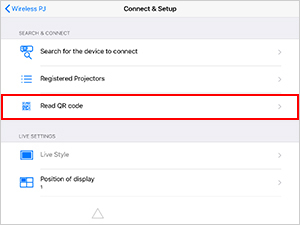 Reading the QR code displayed on the Panasonic Application Mode idle screen enables automatic iOS device and display device connection, and allows the user to commence wireless media pictures. 4- You will be prompted to enter a password. Connect to wireless LAN by inputting a KEY that appears on the idle screen. If KEY is displayed as “ ”, press the buttons on the display device or on remote control as shown on idle screen. *1 Refer to the “Functions Supported On Specific Models” chart for compatibility information. 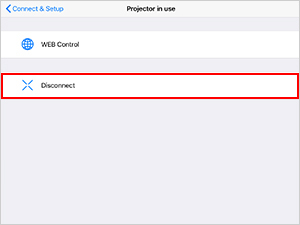 On your iOS device, select [Settings] – [Wireless PJ] – [Oneshot Projection] to turn it ON. Press the Home button on your iOS device. The application screen now closes. By taking a screenshot when the screen is displayed, that screen will be displayed. Connection between iOS device and display device is maintained for three minutes after the application screen is closed, and is thereafter automatically disconnected. Make sure to send One Shot picture before automatic disconnection occurs. 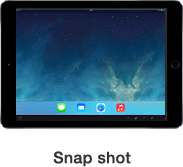 To delete One Shot image from the picture screen, send another image or document file, or disconnect your iOS device from the display device. When connecting multiple iOS devices and selecting the same display style, screen with the latest setting will be displayed. To display the previous screen, select [Settings] at the upper right, then select the preferred position to display in [LIVE SETTINGS]. In the top menu of this application, tap [Photos]. Tap the album containing photos to display. A list of thumbnails is displayed. Tap a photo to display. The selected image is displayed from the display device. You can access the previous or next photo by tapping [<] or [>] on both sides of the screen. You can also access the previous or next photo by flicking right or left on the screen. You can zoom in or out on portions of photos by pinching on the screen. To pan zoomed photos, drag them. Double-tap the screen for an enlarged or same size display. Tapping will start a slideshow, and tapping [Done] will stop it. To adjust how long each photo is shown during slideshows, change the setting in [Settings] – [Wireless PJ] – [Show Each Photo For] within iOS. You can display lines drawn freehand simply by drawing lines on the screen as desired. For details, see "Usage 6: Using the Marker." You can set the toolbar to display or not display by simply tapping the display screen. To return to the top menu, tap [X]. Photos in slideshows are shown in the order in which they are listed in the folder where the selected images are stored. After the last photo in a slideshow is shown, as listed in [Photo Albums], the first photo is shown again. The background color of images can be changed as follows. 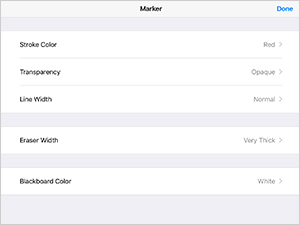 Select [Settings] – [Wireless PJ] – [Background Color] within iOS, and then select the desired background color. The displayed image can be set to be saved or not saved when the image screen is closed. 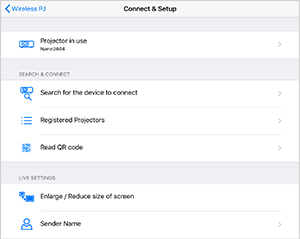 Change the ON/OFF in iOS [Settings] – [Wireless PJ] – [Keep Projection]. Photos hidden with the Hide setting of the iOS device's application cannot be displayed. To display these photos, activate the Unhide setting. Shared Photo Stream photos can sometimes not be displayed. In the top menu of this application, tap [Documents]. The document file list is displayed. Tap a document to display. 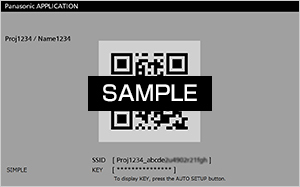 The selected document is displayed from the display device. You can also display the previous or next page by selecting [ <] or [>] on both sides of the screen, or flicking right or left on the screen. Move the slider bar at the bottom of the screen to move to the desired page. You can delete files by selecting [Edit] in the document file list and selecting [Delete] . Document files that contain animation, links, embedded motion images or audio, a Slideshow function, word art, comment displays, or have been scanned at high resolution cannot be sent. You can also display document files saved in the file app. * For iOS11 or later only. The background color of document files can be changed as follows. Select [Settings] – [Wireless PJ] – [Background Color] within iOS, and then select the desired background color. The displayed image can be set to be saved or not saved when the image screen is closed. 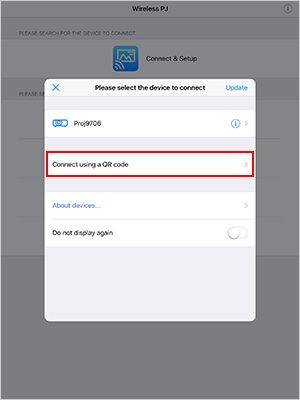 Change the ON/OFF in iOS [Settings] – [Wireless PJ] – [Keep Projection]. In the top menu of this application, tap [WEB]. A browser is displayed in the application. In the address field, enter the address of the page to display. The web page for the designated address is displayed, and the data is sent to the display device. To access and display the previous or next web page, tap [Menu] – [Go Back] / [Go Forward]. To browse and display linked pages, tap links on the current page in the browser. The following operations are possible when this window is open. To stop the web page currently loading, tap [Menu] – [Stop Loading]. To reload the current web page, tap [Menu] – [Reload]. This function is available only when mobile data communication on your iOS device is enabled or network via access point is available with internet service. Some web page content such as videos cannot be displayed by the browser or displayed. The displayed image can be set to be saved or not saved when the image screen is closed. 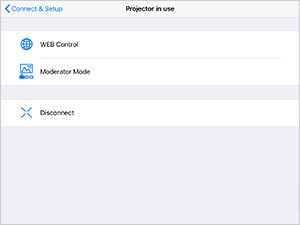 Change the ON/OFF for the iOS [Settings] – [Wireless PJ] – [Keep Projection]. 1. In the top menu of this application, tap [Camera]. Photos from the camera are displayed consecutively. You can also specify use of main or front camera and switch between high image-quality and lower image quality during camera picture. You can select to pause the motion capture picture, and display the image as a still image. You can also choose whether or not to save the picture during pause on your iOS device’s Camera Roll at [Settings] – [Wireless PJ] – [Save Pause Image]. With iPhone, you can select [Menu] – [Light] in top right on screen to turn the built-in LED light on and off. During pause, you can draw freehand lines onto the image with your finger and display them. For details, see "Usage 6: Using the Marker ." The screen during pause sometimes varies from the image. You can draw freehand lines (marker) on image files or document files and send the data as is. In the application, the image, camera-captured image, document file, or web page is displayed. Marker menu is displayed when you select in the tool bar. When you select [Settings] from the Marker menu, the marker settings screen is displayed. In the marker settings window, specify the Stroke Color, Transparency, Line Width, Eraser Width, and Blackboard Color. In the settings window tap [Start Marker]. The settings window is now closed, and . color is updated to your selected line color. With your finger, draw lines on the screen as desired. When you lift your finger from the screen, the line you drew is displayed. 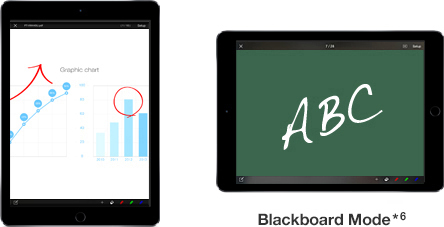 When [Blackboard] in Marker menu is selected in the toolbar at the bottom of the screen, a blackboard with the designated color will be displayed. (Marker data is erased.) To close the blackboard screen, select [Blackboard] again. Marker functions are readily accessible in the toolbar at the bottom of the screen. At first startup, buttons for , , and are shown in red, green, and blue, respectively. As you continue using the application, the button colors are updated with colors selected in [Line Color] in the marker settings window. With each button, you can specify the Stroke Color, Transparency, and Line Width while marking. Marking begins in the color of the button you tap. Lines can be erased by selecting . To erase a line drawn with the marker, trace the line. You can save screens or blackboard screens with marker data written on them as images. Select [Save] in the Marker menu. You can select the saved screen from [Photos] in the top menu and display it again. To erase all of the marker data written on the blackboard, select [Erase All] in the Maker menu. Tap the [Done] button at the top right or select [Stop Marker] in the Marker menu. Once you exit marking, the marks and blackboard screen you made up to that point are removed. When using the Marker function, screen rotation is locked. You can also adjust the Stroke Color, Transparency, Line Width, Eraser Width, and Blackboard Color while marking. You can display the pointer at a touch position on an image, a document file, or a web page. You can also use the Marker function at the same time. Use this application to display an image, camera image, document file, or web page. Select from the tool bar. When you tap the [Done] button at the top right, the Pointer function stops. If the Marker function is being used, it also stops. There are two types of live screen transmission functions, "Live Mode" and “Moderator Mode,” in Panasonic APPLICATION. When a single iOS device is transmitting media wirelessly, the displayed image is displayed in full screen. When additional iOS devices commence transmission, the displayed images from each are displayed in split screen. 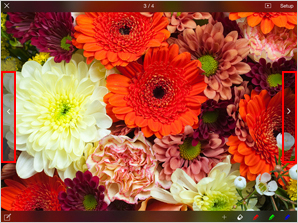 To enlarge an image from an individual iOS device while content from multiple iOS devices is displayed in split screen mode, select [Enlarge/Reduce Size of Screen] in the application, and the image displays at full-screen size. To return to split screen, select [Enlarge/Reduce Size of Screen] on the iOS device displaying content in full screen. 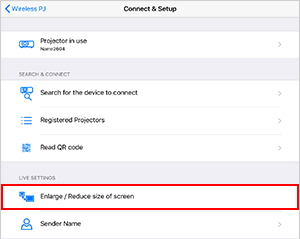 Any iOS device with the display device's on-screen menu – [NETWORK/USB] – [Panasonic APPLICATION] – [CUT IN] switched ON may take over full-screen display from another iOS device already displaying full-screen content on the display device screen. iOS devices with this setting OFF cannot resize images or take over picture from other iOS devices even if content is playing on the iOS device screen. The CUT IN mode is intended to facilitate quick and easy sharing of content to the display device for small groups of people in meetings or classrooms. Select [Connect＆Setup] – [Enlarge/Reduce Size of Screen] in the display device setting screen. 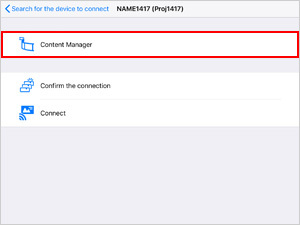 This mode enables the selection and display of an iOS device screen from up to 16 iOS devices connected to the display device. This mode is ideal for groups wishing to share content from multiple screens to the display device screen. Select [Connect & Setup] in the top menu or [Setup] on any screen of the application. Select [Connect＆Setup] – [Projector in Use] – [Moderator Mode] in the display device setting screen. Enter display device username and password to authenticate user, and select [Login]. Panasonic APPLICATION Moderator Mode page is displayed. This enables the user to select an iOS device to display content from via web browser. Press the sender name button of desired iOS device for big-screen pictures. Press the sender name button again. Then return to the page showing multiple iOS device screens. [Connect＆Setup] – [Projector in Use] – [Moderator Mode] in the display device settings screen appears only when communicating with a display device supporting Moderator Mode. 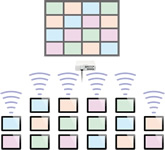 When wireless LAN is set to [SIMPLE] or [M-DIRECT], a maximum of 10 iOS devices can be connected via wireless LAN at a time, and a maximum 10 iOS device screens can be displayed on the display device screen simultaneously. Multi-Live Mode makes it possible for several people to display images from their iOS device simultaneously. 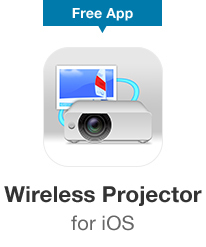 This is handy for meetings attended by participants using a multiple number of iOS devices. The screens from up to four iOS devices can be simultaneously displayed. The screens from up to four iOS devices can be displayed in thumbnail form, and a selected iOS device screen can be switched to a full screen display. The screens from up to sixteen iOS devices can be displayed in thumbnail form, and a selected iOS device screen can be switched to a full screen display. 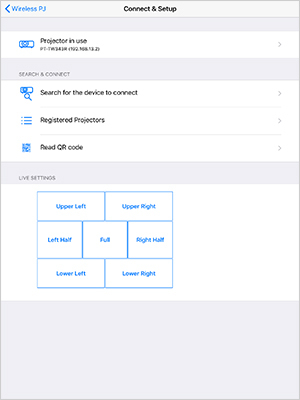 * When using the [SIMPLE] or [M-DIRECT] setting for your display device, you can connect with up to 10 iOS devices at the same time in Multi-Live Mode. 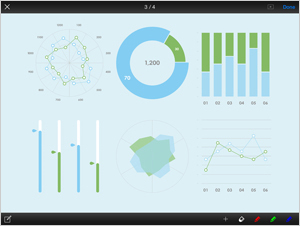 With this application, you can change the display style or select the picture position. 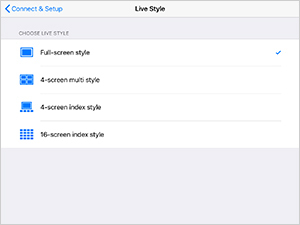 Select [LIVE SETTINGS] – [Live Style], then select the style to be used. The display changes to the selected Live Style, and the image is displayed at the position set with [Position of display]. Select [LIVE SETTINGS] – [Position of display] in the display device setting menu. Select where on the index screen (sub screen) the image is to be displayed. The position set as the display position is displayed. When displaying with Multi-Live Mode, the image is displayed at the set position. Select [LIVE SETTINGS] – [Sender Name] in the display device setting menu. Turn on [Projector the name on the screen]. If this is turned off, the name that was registered during Multi-Live picture is not displayed on the screen. Select [Sender Name], input the sender's name in a dialog box and click the [OK] button. When the display device starts up, it resumes in the same style that was used the last time the display device was turned off. and subsequent iOS will be cut off when the mode is switched to the 4-Screen Multi Style. The Multi-Live style cannot be switched during full-screen display from the display device. 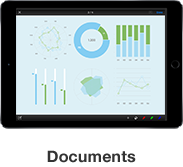 This function allows users to take turns displaying images using multiple iOS devices at meeting. The display style and picture position can also be switched. Select the position to display in [LIVE SETTINGS]. You can connect with up to 4 iOS devices at the same time in Multi mode. When connecting multiple iOS devices, 2-split display and 4-split display cannot be displayed at the same time. 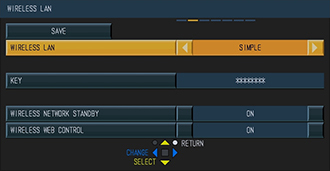 Screen with the latest setting will be displayed. 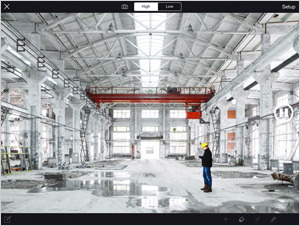 When connecting multiple iOS devices and selecting the same picture position (e.g., selecting left-half in [LIVE SETTINGS], then selecting the same position by the other iOS device), iOS device screen selecting the same position will be displayed. To display the previous screen, select [Settings] at the upper right, then select the preferred position to display in [LIVE SETTINGS]. The display device can be controlled remotely and monitored via WEB Control. After completing “Connecting to a Display Device by Searching for the Display Device” or “Connecting to a Display Device by Using the Registered Display Devices”, select on the right-side edge of the display device. A browser is displayed in the application following applicable model group. Select [Connect＆Setup] – [Projector in Use]. Enter your "Username" and "Password" set in the display device for authentication, and select [Login]. 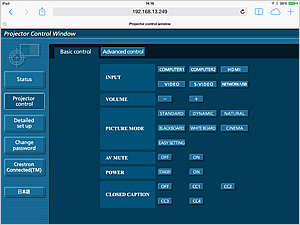 The "Browser control" page is displayed, and the display device can be controlled via WEB Control. Crestron Connected™ pages cannot be displayed, for Web browser do not support Flash. - Select [Back to Wireless PJ] on the left side of the Web browser. - Double click the Home button to get to the multi-task screen, and then select this application. - Click the Home button and close the browser, and then select the icon for this application in the Home Screen. Select [Connect＆Setup] – [Projector in Use] – [Disconnect] in the display device setting menu. You can do the following operations to check the Network ID of your display device. The screen displayed may vary depending on the display device model. For details, check [About Devices...] on the [Please select the device to connect] screen that appears right after starting the application. 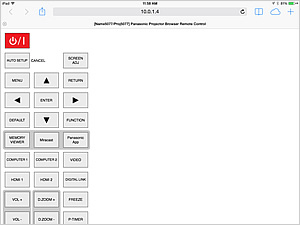 Press the [Panasonic APP] button on the display device remote control, and then refer to [Proj＊＊＊＊] on the upper left section of the idle screen. 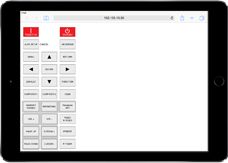 If the idle screen is not displayed, press the [AUTO SETUP] button on the remote control and check the Network ID ([Proj＊＊＊＊]). [NETWORK (Panasonic APPLICATION)] – [Proj＊＊＊＊] on the [INPUT GUIDE] screen. To allow multiple users to take turns displaying images, access the display device's on-screen menu and turn the following settings [ON]. A connection error may have occurred immediately after the display device was turned on or switched to different input. If so, make sure to wait a while (longer than one minute), then connect again. If the Wi-Fi icon is not displayed on the upper-left corner of the screen (See below), complete the following settings on your iOS device. If the Wi-Fi icon is not displayed even after using the above method, confirm with the following method. 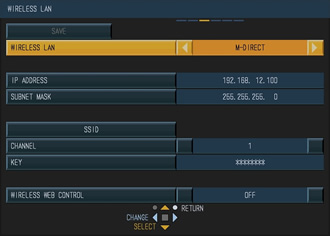 Select the Details button on the right-side edge of the connection network (the network with the checkmark), and confirm that values have been set for the [IP Address], [Subnet Mask], and [Router]. If an AD HOC connection such as [Panasonic Display1] was made, nothing will be displayed in [Router]. In [Settings] – [Wi-Fi] – [CHOOSE A NETWORK...] on your iOS device, check the wireless network name. If [NetworkDisplay] or [NetworkDisplay＊＊＊＊] is not shown, temporarily change the [WIRELESS LAN] setting on the display device to another network number, wait a moment, and then restore the setting to the previous network number. 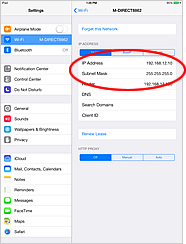 Make sure [NETWORK] – [WIRELESS LAN] in the display device's on-screen menu and the access point settings on your iOS device are configured correctly. 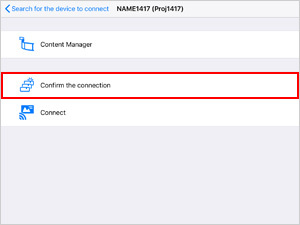 If you quit the application while it is connected to the display device, the display device's Network ID may no longer be displayed. If so, wait a moment and then tap [Update] to update the list. Make sure the display device's Network ID [Prof＊＊＊＊] check-marked in [Search] on [Connect＆Setup] screen matches the display device identified in [NETWORK] on the [INPUT GUIDE] screen. 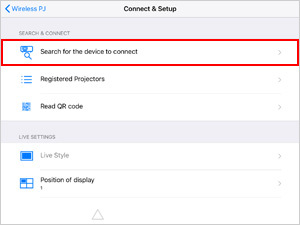 If they do not match, of if no display device is selected, see "Connection Case 1: Connecting to a Display Device by Searching for the Display Device” and establish a connection. The following files may not be displayed properly. * iTunes, iPad, iPhone, iPod touch, Safari, Keynote, Numbers, and Pages are trademarks of Apple Inc., registered in the U.S. and other countries. App Store and App Store Logo are service marks of Apple Inc., registered in the U.S. and other countries. PowerPoint, Excel, and Word are trademarks or registered trademarks of Microsoft Corporation in the United States and other countries. Crestron Connected™ is a trademark of Crestron Electronics, Inc.
Ricoh Bitmap Font is used in some on-screen menus, and is made and sold by Ricoh Co., Ltd.
All other trademarks and registered trademarks are the property of their respective owners. The ® and ™ symbols are not displayed in this document.